Jew against Jew: Dozens of rightist activists, including fans of the Betar Jerusalem Soccer Club, clashed with locals in Tel Aviv Saturday in the wake of the leftist rally in the city. Earlier, thousands of leftists marched through the city to mark "43 years of occupation" and express their displeasure with the lethal IDF raid on a Gaza-bound ship earlier this week. Following the leftist rally, dozens of rightists marched along Ibn Gvirol Street, one of Tel Aviv's major thoroughfares, shouting at coffee shop goers: "Stinking Tel Avivians, get out of your bubble…While IDF soldiers are subjected to a lynching you remain indifferent – you're traitors." 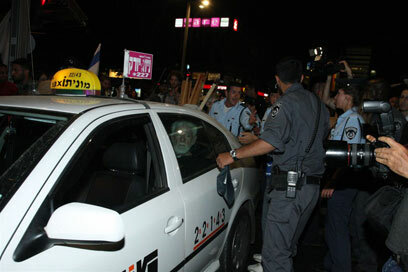 Earlier, rightists spotted left-wing activist Uri Avnery going into a taxicab on Ibn Gvirol Street and charged at him, attempting to wrest away the signs he was holding. Police officers at the scene intervened and rushed Avnery away from the scene. Large police forces escorted the rightist activists, who were holding up a puppet of Turkish Prime Minister Erdogan and threw Turkish flags into the garbage. At one point police asked the right-wingers to disperse, claiming they were staging an illegal protest. The rightists refused, and eventually police officers left, without dispersing the protestors. See all talkbacks "Rightists slam 'stinking Tel Avivians'"